Short for Crazy +Travel (sounds perfect for us), this English friendly activity booking sites allow travelers to book tickets on specially handpicked activities online. For example, instead of queuing to buy entrance tickets at the activity venue, you can purchase it earlier to avoid all the crowds. Don't know where to go? You'll also get to discover new places and activities as you browse through the website. It's definitely, time-saving and you can also get better-priced deals and may save up to 60%! 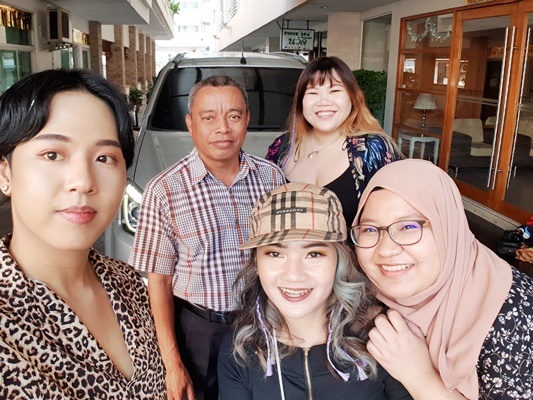 For the first #BAES (Bo, Anis, Eros & Sydney) overseas trip together, we decided to visit Bo's home country, the land of white elephants, Thailand. We've been talking about visiting together for years, and the fact that it came true feels unreal until today! We had a blast & managed to cramped in so many activities within the short 4 days 3 nights trip, and got to take so many pictures too. I can't wait to share more about our activities in other posts soon! 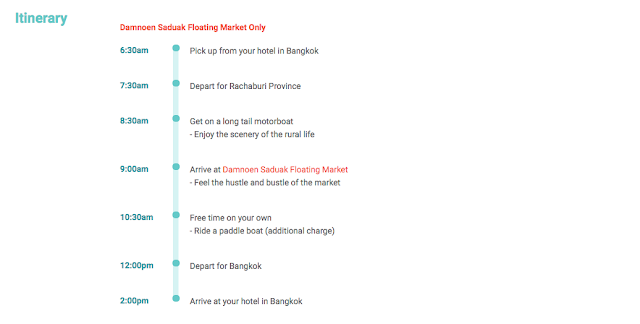 Of course, our visit to Thailand won't be complete without us experiencing the local floating market activity so on our third day there, we decided to visit the Damnoen Saduak Floating Market. 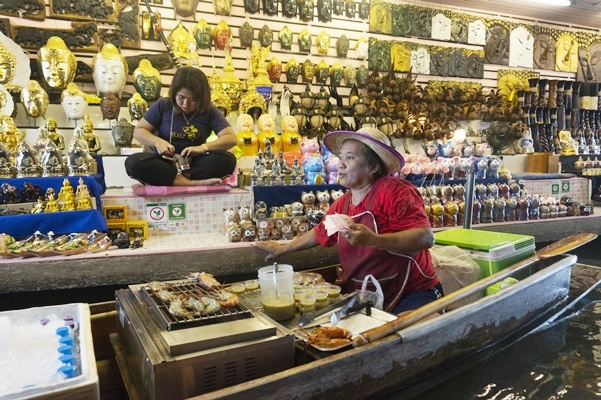 It is a bit further out of the city center, but since Bo suggested us to visit the original floating market location in Damnoen, Ratchaburi province instead of other floating markets, of course, we went with local opinion. 3. Long tail motorboat ride included. 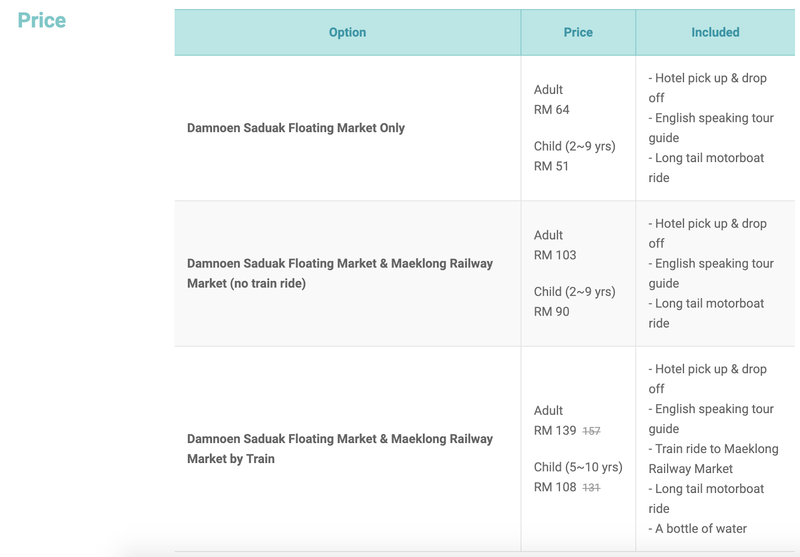 All of these would only cost each person RM64 which is a steal, considering the traveling time is about 1.5-2 hours (one way) and the fee for the long tail motorboat ride per hour alone would cost us about 800 baht (RM70) per boat (if we visit by ourselves). But since we're planning to blog about the travel anyway, I tried to reach out to Trazy for a collaboration & they've kindly replied back to us with good news! Of course, this trip might be sponsored, but the opinion about the experience is solely mine and definitely is unbiased. Our tour guide & the driver for the day Khun Loong Samai arrived just on time and was really nice to offer to drop us at a nearby market to get some breakfast first before we continue our journey to the Damnoen Saduak floating market. The journey there was without any issue as we were happily munching on our breakfast & putting on makeup (it was too early to put on makeup at our Airbnb so we brought our makeup bags lol). 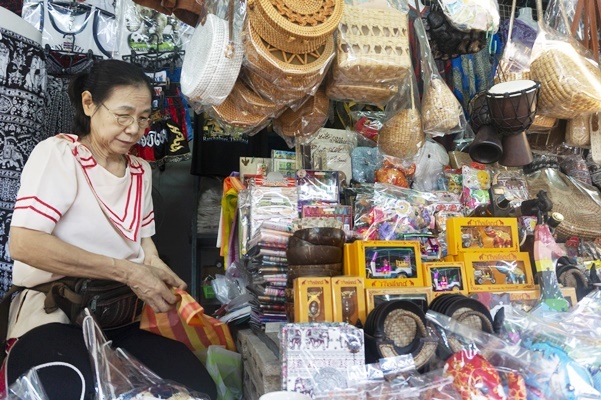 Local Tips: 'Khun' is a polite way to address someone in Thai & 'Loong' means uncle. 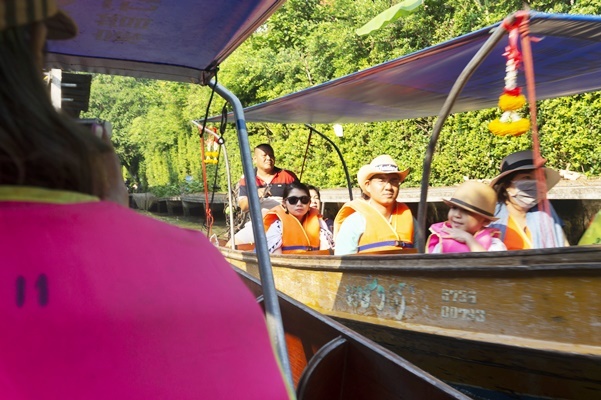 As soon as we arrived, Khun Loong Samai had arranged the rental of the long tail motorboat that would bring us on a one hour tour at the floating market venue. We got lucky because we got the motorboat with a roof too! It was a hot day but thanks to that, we had quite a comfortable sightseeing session. It was really interesting to watch the locals and tourists interactions, selling and buying foods as well as souvenirs from the boat. Of course, I didn't miss out on the experience either! Got myself to enjoy some yummy grilled prawns, and fresh local fruits during the ride & bought a souvenir to bring back as well. For food, price-wise they are not that different than Bangkok so it was pretty affordable! Local Tips: If possible, bring a local to get the 'local price' on items or you'll get charged the tourist price for items like souvenirs. We were lucky to have Bo (the local) and Syd (the expert bargainer) to get selling prices down! Another must have experience in Thailand: enjoy the local coconut drink. They're so good, even thinking about it now makes me feels so thirsty! I shared one with Bo during our motorboat ride & guess what? On our way back to the Airbnb, Khun Loong Samai bought us another coconut drink each. Super good service! At the end of our motorboat ride, we were dropped off at the first point we arrived. One hour might sound like a long time, but time flies by so quickly, we didn't even notice that the tour is already over. The ride was also smooth sailing, our motorboat driver skillfully took us around despite the narrow canals. It was a really good and unique experience but if there is something I wish is better than it was, it would be the choices of items sold there. Maybe because we went to Chatuchak market and the Train Night Market Srinakarin before visiting the Damnoen Saduak Floating Market, the choices of foods and items to purchase did seem a bit dull in comparison. Despite that, I don't regret the visit at all because now, I can proudly say that I have experienced one of Thailand uniqueness myself! Buying foods on a moving motorboat is memorable indeed! 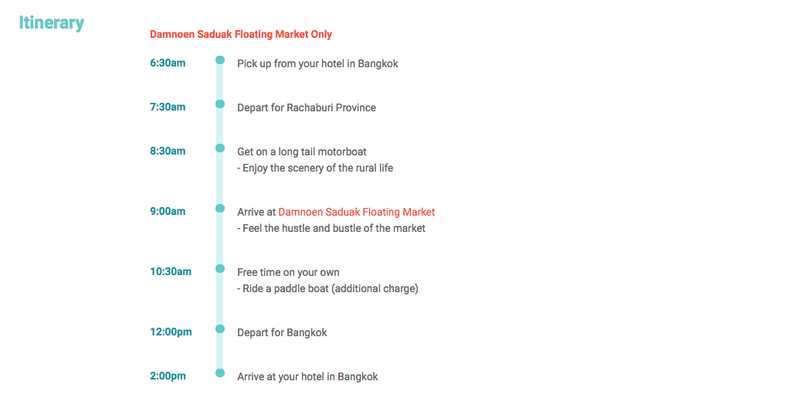 To experience the tour, kindly visit the Damnoen Saduak Floating Market Tour booking page on Trazy website. 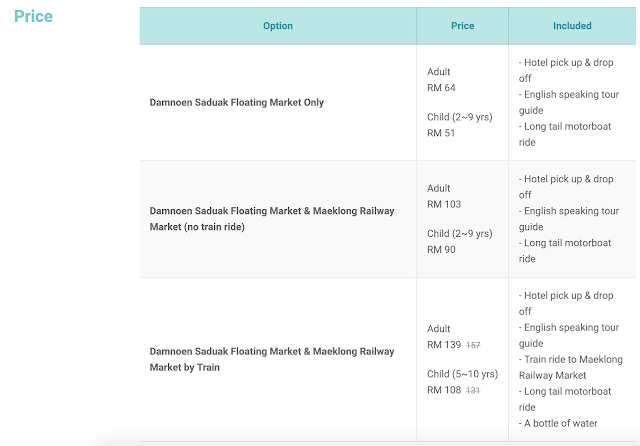 You can also opt to visit the Maeklong Rail Market for an additional fee. I'll be back to write more about other venues in our Bangkok 2019 trip so stay tuned! Meanwhile, you can watch our trip vlog uploaded on Eros channel too. Floating market vlog starts at 21:34! 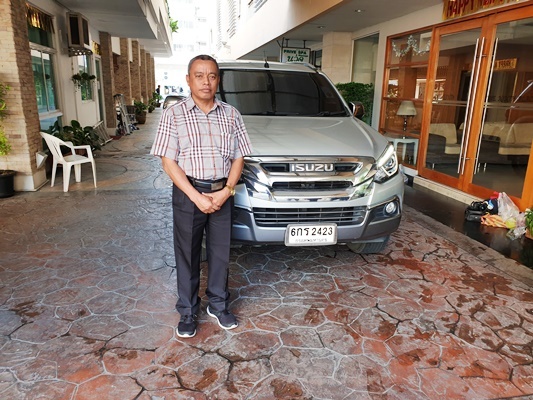 Thank for reading, Khob Khun Ka.